by marc / Wednesday, 23 January 2019 / Blog Category: Everything Vegas. We’re always looking for the best times to visit Las Vegas. The World Series of Poker (WSOP) is a great event to either watch or participate. Poker’s most popular festival is set to run from May 28 to July 16, 2019. Once again, WSOP will take place at the Rio All-Suite Hotel & Casino. This marks the 50th running of the World Series of Poker and there are special events being planned throughout the event to commemorate the occasion. This year there will be even a celebratory gala and awards evening on Saturday, June 29 and a huge opening weekend event. The longest-running, richest and most prestigious poker tournament series expects to award more than $200 million in prizes this year. One of the new and special tournaments for the 50th WSOP is The Big 50. The WSOP is making everyone’s initial entry into The Big 50 rake-free. All $500 of the entry will go entirely to the prize pool. (Anyone who re-enters pays the normal rake, including re-entries into another flight). The Big 50 will feature four starting flights (Thursday-Sunday am) where players begin play with 50,000 in chips and play 12, 50-minute levels on Day 1. The WSOP has a $5 million prize pool guarantee, as well as ensuring the winner claims $1 million for the Big 50. The $10,000 buy-in Main Event will start on July 3, 2019. There will also be opening round flights on July 4 and 5. The Main Event will continue through July 16 and will air exclusively on PokerGO and ESPN. 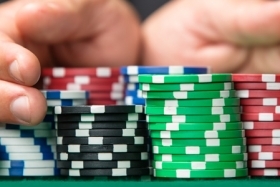 The World Series of Poker isn’t only an event for those participating in the tournament. Poker fans can watch the events in person at the Rio for free. Watching live poker is more fun for some than others. However, you’ll never see this many poker players in one place at the same time. The WSOP is away from the main casino action at the Rio and even has a number of vendors offering products that will appeal to players and fans. The World Series of Poker is quite a spectacle. It might not be worth a trip to Las Vegas just to watch but it’s definitely something unique to check out if you’re in Las Vegas from May 28 to July 16. Visit WSOP.com for more information. Click here for discounted rooms at the Rio.